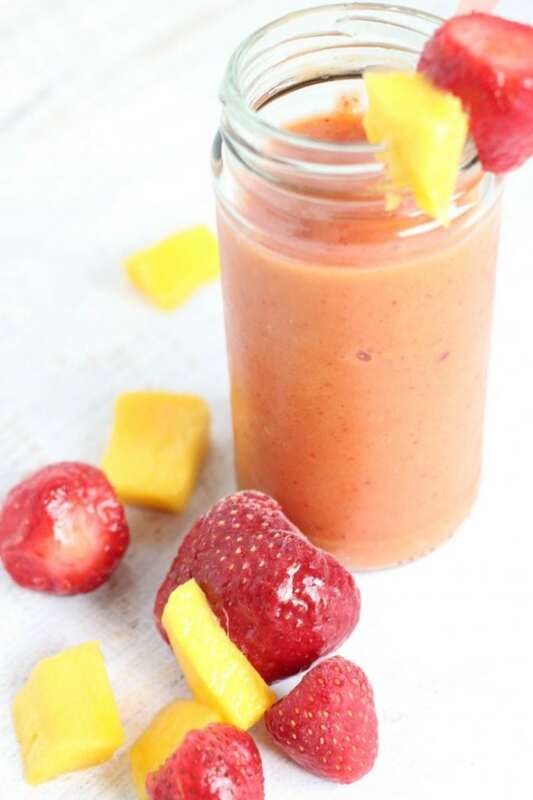 This Strawberry Mango Smoothie is both delicious and guilt free! 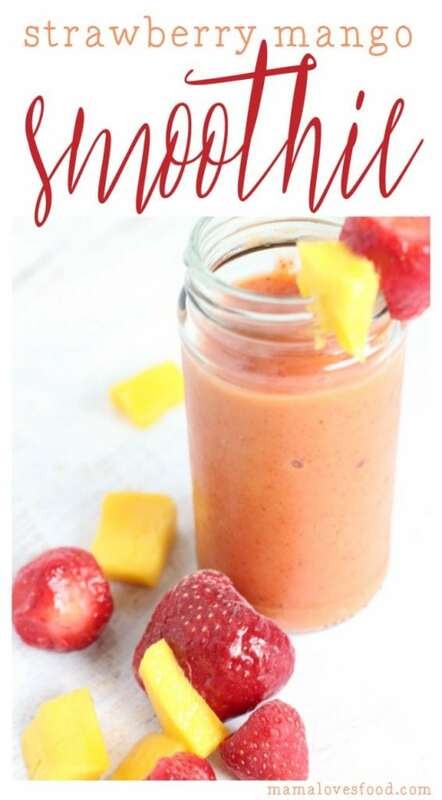 Made with only fresh fruit ingredients, you can’t go wrong with this recipe! Three years ago, I was bursting at the seams pregnant with my 5th kiddo (yes, I know how that happens). I looked like an overripe watermelon and felt as though someone had shoved a writhing angry cat under my shirt. It was one of the hottest summers we’d experienced in years and I was completely (COMPLETELY) miserable. I spent many as many afternoons as possible sitting at the edge of my girlfriend’s pool with her giant oscillating fan aimed directly at my swollen toes and enjoying the fresh fruit she always had on hand. Up to that point I really didn’t care for mango, but she served up the freshest, ripest, juiciest mangoes cut into the most perfect little cubes and I couldn’t help but fall in love with them. Since then I get giddy whenever I see mangoes go on sale in the market and have the tendency to buy more than we strictly need. In order to not be wasteful, because – seriously – I buy wayyyyyyy more mangoes than we can eat before they start to spoil, I’ve started cutting them up and freezing them for ice cream, and smoothies, and tasty tasty cold refreshing snacks. (I’m in Florida. It’s *hot*. Frozen things are goooood). 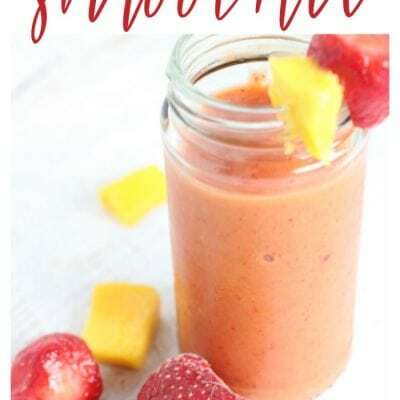 This Strawberry Mango Smoothie is the perfect deliciously simple way to use up some of that frozen mango! If you don’t buy gads and gads of mangoes when they go on sale, you’re welcome to just pick up a back of frozen cubed mango from the freezer aisle of your market. I’ve definitely been known to do this when we run out! I really like using coconut water in this smoothie because it’s got that hint of tropical flavor without being heavy or making the recipe super calorie dense. Coconut water is also full of natural electrolytes which is important to those of us chasing kids in 100+ degree heat all summer. Plus it tastes good. Which, I probably should’ve led with. P.S. It tastes really good. All that said, if you’re going for a creamier more ice cream like smoothie, feel free to switch the coconut water for full fat coconut milk or cream. Mmmmmmm. That would be tasty too! 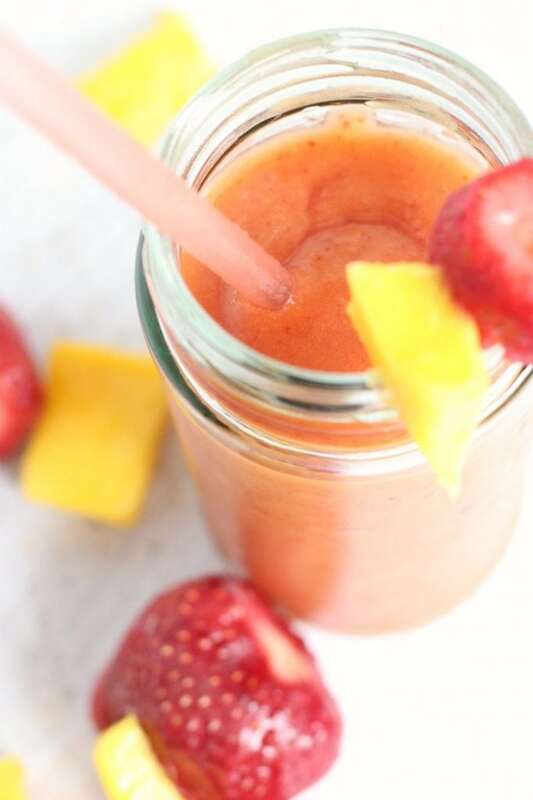 This Strawberry Mango Smoothie is both delicious and guilt free! 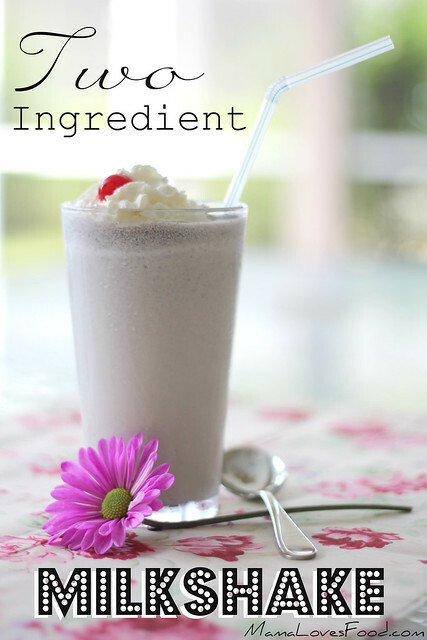 Made with only fresh fruit ingredients, you can't go wrong with this recipe! 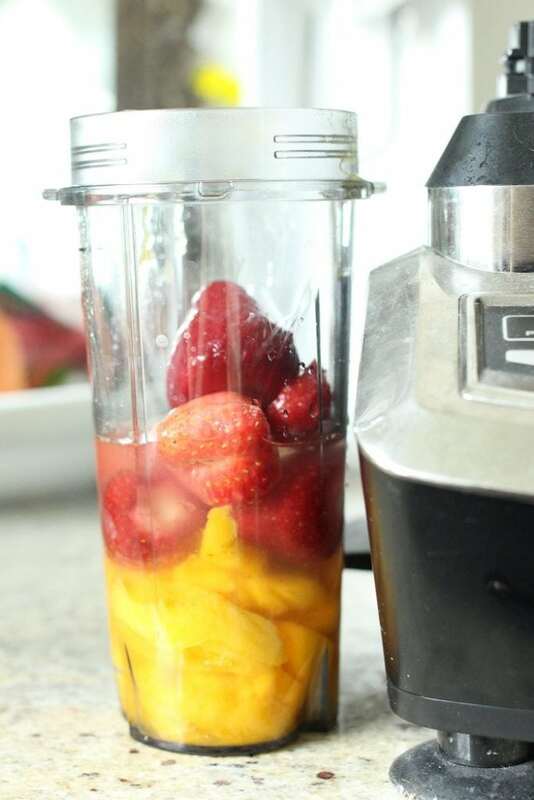 Add equal parts mango and strawberry to your blender, then fill the empty space (to the top of the frozen fruit) with coconut water. Garnish with extra fruit and enjoy! 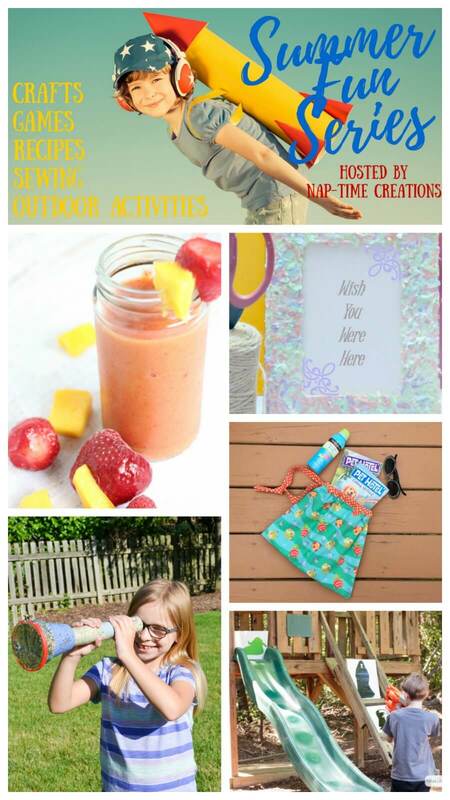 Head over to Nap-Time Creations/Summer Fun to see all the posts in the series. Make sure you’re following me on Facebook for regular food and family updates! 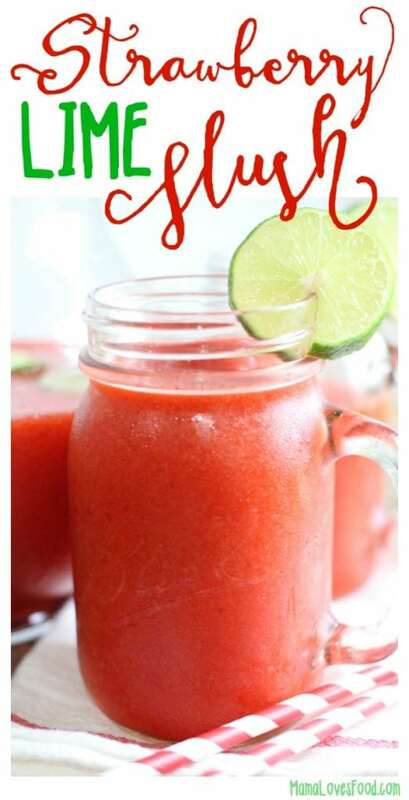 « Summer Cocktails to Make You Forget About the Heat! Just love your recipes. I have tried most of them and you can't go wrong here. Delicious!